I thought it was already known these waves were from constructive interference from different wave sets. EMS – that’s just one of the theories listed here. 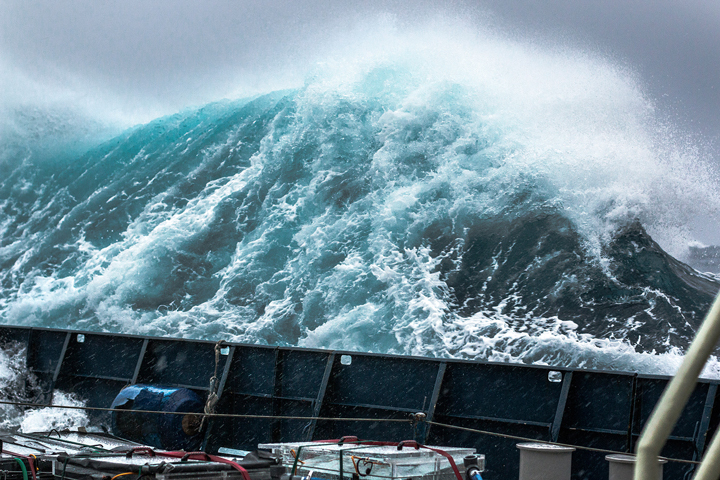 Yes, there is a lot of research being done on “rouge waves” — a simple web search for “recent studies rogue waves” reveals quite a few — even a review study. They are mostly concerned with 20-30 meter waves — but from my personal experience, small rogue waves (outliers in wave size by 200-300 %) are common enough that I have run into several in 15 years at sea in a 40 foot catamaran. The funniest one (in that it did not cause a disaster, thus we could see the humor) was when our youngest son was at the helm and my wife and I were napping in our cabins with overhead hatches opened and angled forward to catch the breeze — we were riding smoothly over 3 foot swells and the helmsman was bored with the conditions — failed to notice the 10-12 foot swell approaching. The rogue wave broke over the bow, with the curl coming down on the high cabin top, dumping 50 gallons of sea water into each forward cabin and washing the upper decks clean. Had the boat been of a different configuration, we could have been in real trouble with that much sea water coming aboard. On a different occasion, while towing our inflatable dinghy through the Vieques Channel, between Puerto Rico and Isla Vieques, a rouge wave from astern broke into the inflatable – filling it completely. The inflatable stopped while we sailed on running with the storm. The sound was horrendous, and I was sure we had snapped a mast stay …. alas, when looking astern, I saw we were towing just the inflatable painter — no boat. As far was we could tell, the dinghy never resurfaced (not that we could see) — nor did it wash ashore and get reported to the Coast Guard.